This title might be different than you’re used to seeing; being a pediatric-focused office, most of my articles and workshops center on kid-related challenges such as ADHD and ear infections. However, with all the kids we care for comes one other common ingredient – mom! They get up before the sun (often with little sleep from waking up to care for their child), drink their first cup (or bucket) of coffee, and begin to attack the day. They dive into making breakfast, packing lunches, dropping kids off/picking them up, helping with homework, confirming appointments/activities, and for many of them, somehow finding time to get themselves ready for their own day. If you’re thinking “sounds about right” while reading this then you also know what early mornings and busy days can do to even the most super of Super Moms. For most moms we care for it’s a couple of things wrapped together in one: fatigue, headache, neck and upper back tension, and foggy thinking. Many of my blog posts have discussed the “perfect storm” that we see our kids today go through, often leading to the now pandemic list of struggles they have – autism, ADHD, allergies, asthma, and on. However, the reality is that parents -moms especially- have their own “perfect storm” that brews day in and day out, year after year. Depression, anxiety, thyroid disorders, headache and migraine challenges, metabolic and hormonal disorders now affect the majority of adult women in the United States. When women start struggling with these health challenges, they often to turn to “over the counter” forms of help: coffee and caffeine during the day to compensate for low energy and foggy thinking, wine at night to help unwind, drugs for headaches and pain, etc. When these challenges escalate and get worse over time, they’re often forced to rely on prescription anti-depressants, migraine medications, and thyroid drugs. Just like the “Perfect Storm” kiddo is now commonplace in the US, the stressed out, worn down Mom is the “new norm” as well. Interestingly enough, the cause(s) of this pandemic are the exact same: too much stress, poor dietary habits, and sedentary living. The “3Ts” we talk about in chiropractic (Thoughts, Traumas, and Toxins) affect adults just the same as kids by overwhelming our central nervous system, leaving it stuck all day in what is called sympathetic (fight/flight) overdrive. The longer we stay “stuck” on the gas, the faster we burn out and wear down. All of this adds up to something Doctors of Chiropractic term “subluxation”, which is simply an overstressed, overworked, poorly functioning spine and nervous system. For women, subluxation and stress bears down and typically gets stuck in their neck, right in between the shoulders, and the hips or pelvis. In our office, we run a set of scans that measure nerve function and stress. These scans are absolutely crucial in helping us determine EXACTLY where women are holding all their stress and EXACTLY what it’s doing to their health and vitality. For the nerve and muscle tension component, we run a scan called an EMG, which “lights up” in most women’s lower neck and upper back. Most have been holding tension there for years by the time we check them, and that tension (subluxation) has worn down their nervous system so much that it affects the systems and glands it controls, leading to chronic headaches and thyroid issues. The EMG scan pictured here is a classic scan we see on adult women, especially stressed out moms. The dark red and black colors in the neck indicate long-standing tension there, and there is also stress in the upper back and left SI joint (pelvis). The yellow colors in the “core” region of the spine indicate the “burn out” and weakness often seen there as well. In our office, moms often hold off on their own care, sacrificing their own health and energy for the good of their kids. It’s in virtually all parents’ DNA to let ourselves get run over again and again because we think it’s for the good of our kids. We tell ourselves we have to sacrifice our own health and well being to ensure theirs. Unfortunately, that couldn’t be further from the truth. Moms are the quarterback, head coach, coordinator, GM, and owner of most family’s health care team. Being constantly stressed, sick, struggling, and “out of gas” has a huge impact on a family. Bottom line: when moms suffer, the whole family does. We do all we can at PWC to not just “calm the storm” for the kids we care for, but also for the parents, especially the Super Moms I’m reaching out to. Because you rock star epic moms care more about your kids than anything in the world, it is my hope that this article and the words within it help motivate and inspire you to not let the “new normal” of exhaustion, stress, and sickness be your normal. It’s my hope that you put your health first- not last- so you can continue doing what you do to put your family first. If you’d like to get your health, energy, and vitality (or as I like to call it – “mojo”) back, then there is simply no better place in this community to do that than our office. 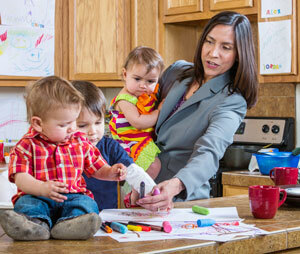 Yes, kids are our specialty, and that means so are MOMS! We get you. Now give us a chance to let us help you. If you’d like to get a set of scans and health evaluation from our docs, simply give us a call at 815.455.8213 and tell one of our team members (all rock star moms themselves!) you read this article and want to get your health and energy back! We’ll get you scheduled, scanned, and a plan in place for you to be Super Mom without the “side effects” you’re stuck with now! Because we know that health and wellness for moms is so important, we routinely co-host an incredible event – Women, Wine, and Wellness – at Akasha Yoga in downtown Crystal Lake. 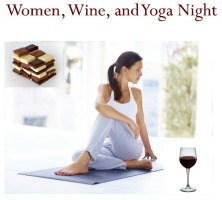 Every mother who schedules a New Patient appointment at PWC during the month of February will also receive a free ticket to our next Women, Wine, and Yoga event on March 11th! Spaces are somewhat limited, so please call today and take advantage of these two amazing ways to get your “mojo” back!